We can straighten your teeth using clear aligners and use them to dramatically improve your smile. Instead of using traditional metal braces where we bond brackets to the teeth and thread wires between them, we use clear aligners to straighten teeth. This process is just as effective but you will not have the inconveniences associated with metal braces nor will your appearance be impacted by them. The treatment times can be roughly the same, so it comes down to a level of convenience and what you want to look like while straightening your teeth. We understand that how you look during your treatment matters as much as how you look afterward and our solutions are designed to ensure that you look and feel great. We use Invisalign® to straighten crooked teeth. This is one of the most convenient options available today, and our adult patients love that they can straighten teeth without the hassle of traditional metal braces. Invisalign® aligners look like a full retainer that surrounds both the upper and lower teeth. A dental lab will make these aligners based on the current position of your teeth and where they need to go in order to straighten. 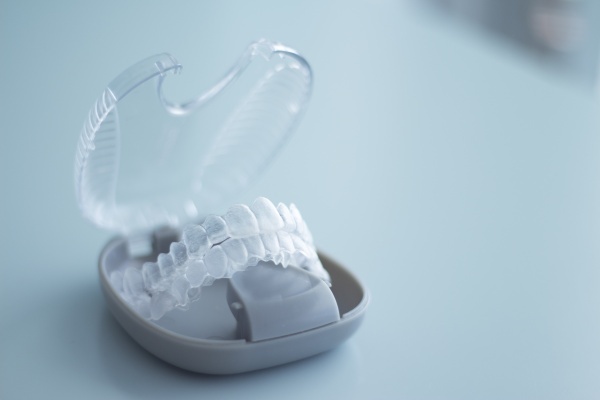 When you first visit our dentist office, we will take digital images and measurements to create a series of aligners that you will wear in sequential order. You will wear each aligner for around two weeks. When you first put an aligner on, it will feel very tight. Your aligner is going to put pressure on your teeth to move them slightly. When the two weeks is over, the aligners will be loose and it will be time for the next aligner to move your teeth that much more. By wearing all of them, your teeth will go from crooked to straight in a beautiful way. Since the aligners are completely clear and nearly invisible it will be difficult, if not impossible, for people to tell that you are straightening your teeth. Since you only need to wear your aligners for 22 hours a day, you get to take them out to eat and brush your teeth. This makes them a convenient solution and you will not have any food restrictions. We can give you the smile of your dreams by straightening your teeth using clear aligners. You do not have to live with crooked teeth or a misaligned jaw that causes discomfort or embarrassment. You do not have to worry about food sticking between crooked teeth or having a terrible smile in a family photo. Instead, you can have a straight and beautiful smile that you are confident and proud of. We can give that to you and encourage you to schedule an appointment to get started. Call (772) 492-7045 today to reach Anthony DeLucia D.D.S., P.A..
Are You A Candidate for Wearing Clear Aligners?